Everyone (parents too) is invited to the BBQ planning meeting starting at 6:30 at Dennis Longnecker’s house. He will provide Shredded Pork, Hot Dogs, condiments and everyone else provide something else. 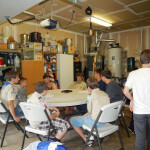 During and after the eating, the scouts will work on the activity schedule for the 2015-2016 scouting year. We are Scout led, so this is the time the Scouts get to pick what they want to do! (But you can’t plan eCamp every weekend!) Come…be heard!